Home / Portfolio / Retirement: The Best Is Yet To Come! Many advisors’ answers focus only on the financial. How much money do you need, where to live, how to downsize. Very few focus on how to be happy and fulfilled, productive and engaged, helpful, giving back as an experienced, mature sage, advising younger people. Most writers on the subject of retirement seem to focus primarily on how to be financially secure in your retirement years, to ensure that your money and your savings last as long as you and your dreams do, and that is a very important focus for those that are preparing for, or are about to enter the retirement ranks. 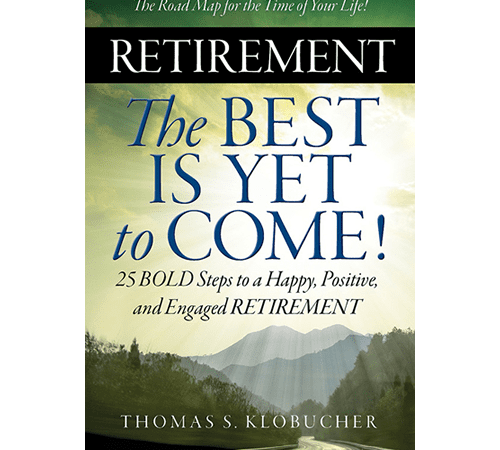 This book, The Best is Yet to come; by Tom Klobucher: is about staying young at heart, being happy, engaged, fulfilled and giving back during your “retirement years”.